Scientists in India have developed a way to extract juice effectively for the first time from a berry which is thought to be good for the heart. Sea buckthorn is a known source of cholesterol-lowering compounds which could prevent clogging of the arteries. It is used in Tibet, Mongolia, China and Russia for health drinks. But the researchers, writing in the Journal of the Science of Food and Agriculture, report current extraction methods produce juice of poor quality. A team at the Regional Research Laboratory in Trivandrum have solved the problem by developing an extraction technique which uses continuous high speed centrifugation to separate the juice from the solid sludge. The process was shown to retain a significant proportion of the key anti-oxidant chemicals which scientists believe can aid the circulatory system by blocking the action of harmful LDL cholesterol. When LDL cholesterol is oxidized, it sticks to the lining of blood vessels, causing them to clog up. Analysis showed that the extracted juice contained more than 40% of the original polyphenol content from the whole berry, along with 50% of the original flavonoids and 70% of the vitamin C.
Sara Stanner, a nutritionist at the British Heart Foundation, said: "The antioxidants in sea buckthorn juice and pulp may protect the heart by reducing harmful chemicals in the blood. "The pulp oil also contains unsaturated fatty acids and plant sterols, which could help to reduce blood cholesterol levels. 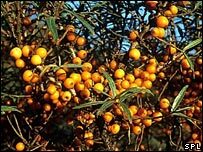 "In addition, there is evidence that sea buckthorn juice might help to protect 'bad' cholesterol from oxidation, a process which is involved in the development of coronary heart disease. "The oil has also been shown to have a possible benefit in reducing the tendency of blood to clot but more research is needed to clarify whether adding it to foods can have any real impact on reducing risk of heart disease." Two companies have shown interest in the process including one based in Mongolia.